How many bloody tablets does one company need? And how many bloody sizes do they have to come in? 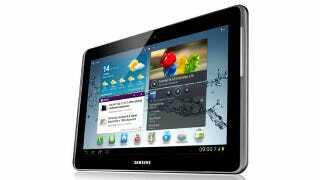 Samsung's added a 10.1-inch size model the Galaxy Tab 2 7-incher which was announced just the other day, whacking Ice Cream Sandwich and a 1GHz dual-core processor into the obese frame. No, seriously - it's actually fatter and heavier than the original 10.1-inch Galaxy Tab. The 10.1-inch screen is a 1280 x 800 WXGA affair, and bolted to the front of it is a VGA camera for video calls, though a 3-megapixel rear-facing camera lurks 'round the back. A battery of 7000mAh should keep you powered-up nicely through the day, though we would've liked to have seen more onboard storage than the 16 and 32GB options available. But hey, at least there's a microSD card slot. Weighing in at 588g, it measures 256.6 x 175.3 x 9.7mm, which is noticeably heavier and fatter than the original Galaxy Tab 10.1-inch model, which weighed 565g and measured 256.7 x 175.3 x 8.6mm. Is that enough of a backwards step to make you feel dubious about this latest tablet? Mouth off below, and let us know.